Work holding clamps are essential with a DIY CNC machine. When you cut material, you need to make sure that it is held in place securely. Professional machines use impressive vacuum systems, vices and jigs. My humble Mostly Printed CNC will make do with clamps. Proper clamping systems are expensive, usually $10 or more each, plus the cost of something like a t-slot rail to hold them. 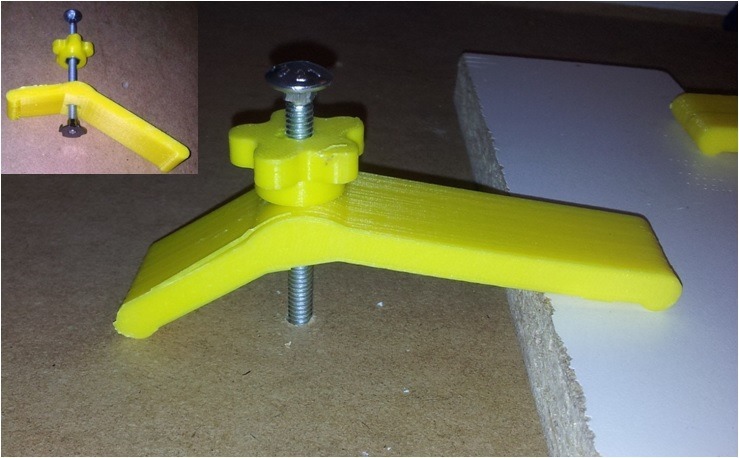 I will start off with a solution made from 3D printed plastic, carriage bolts and T-nuts. This will bring the cost-per-clamp down to under $1.50. As described previously, I drilled some small pockets underneath my waste board for t-nuts. The MPCNC has 30 t-nuts, placed around 4” apart. A carriage bolt is then used to hold the clamp in place. One of the things I will have to be careful with is making sure that the cutting tool does not stray into a clamp or, in particular, a carriage bolt. This means that I should probably include the work holding clamps in the CAM software so that the G-code will automatically stay clear. Yet another thing that I have to learn. There are various designs for holding clamps available. I chose this one. It’s reversible in that it can work at two different heights. The knob holds a captive nut for securing the clamp in place. I am not sure that plastic holding clamps will be strong enough in the long term. But that is what I will try for now. The 1/4-20 carriage bolt and nut cost around 40 cents at Home Depot. Roughly $1.00 of plastic extrusion is needed to print the part and the knob. I printed the clamp with about 40% infill, with 25% for the knob. The plastic used was ABS, but I may also make a few with PETG.